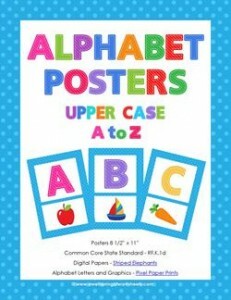 This alphabet posters set contains all the letters of the alphabet in one easy to print PDF. Blue polka dot background, striped letters, and pictures that begin with each letter. Please go to this page to see all the uppercase alphabet posters in this set.